Biotoxicity.com EBPI Environmental Bio-Detection Products Inc. 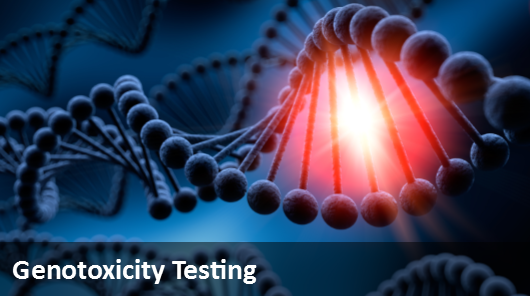 Specializing in Biomolecular Testing kits for Toxicity, Mutagenicity, and Genotoxicity. For 25 years, EBPI has been a leader in the environmental biotechnology testing industry. With clients throughout the world, EBPI strives to continue its leadership in the international market. EBPI is dedicated to the development of user-friendly, analytical systems that will assist in the sustainable development of global economies. Research laboratories, environmental consultants, government, academia, human health and nature preservation organizations, municipalities, and many other industrial sectors use EBPI products and services. EBPI offers many necessary BioToxicitySM services, as well as novel BioToxicityPM products for the global market. 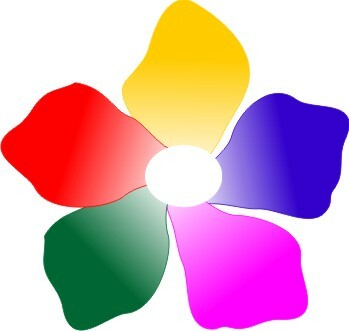 Furthermore, we are fully capable of providing custom services, tailored to meet unique project requirements and individual client needs. 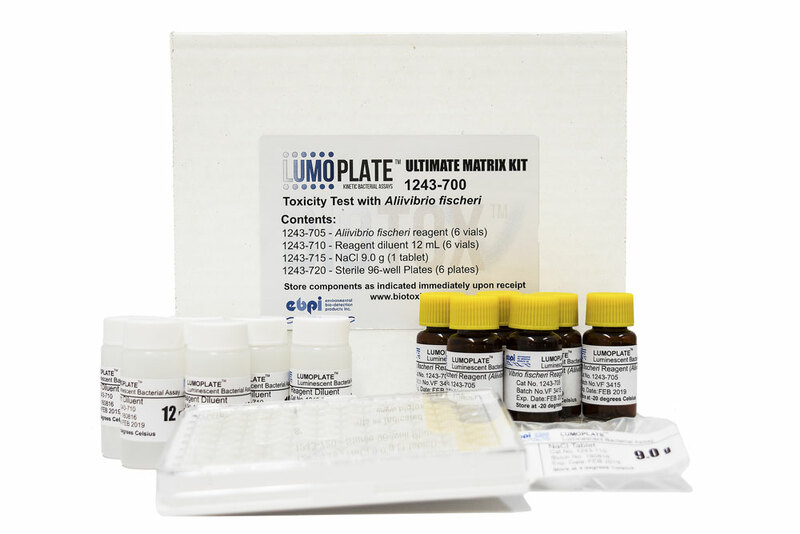 Click here for EBPI's full line of Ames Test Kits. 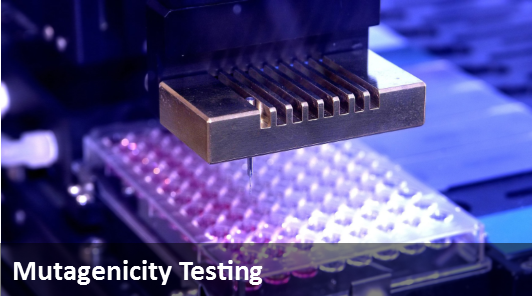 Click here for EBPI's full line of Genotoxicity testing kits. 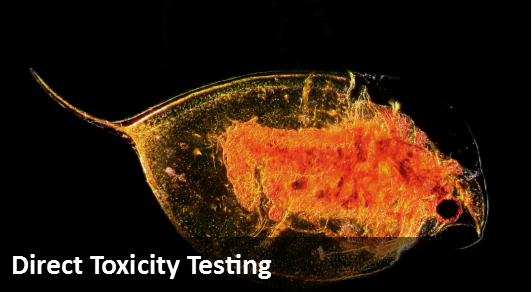 Click here for acute toxicity tests of higher organisms. 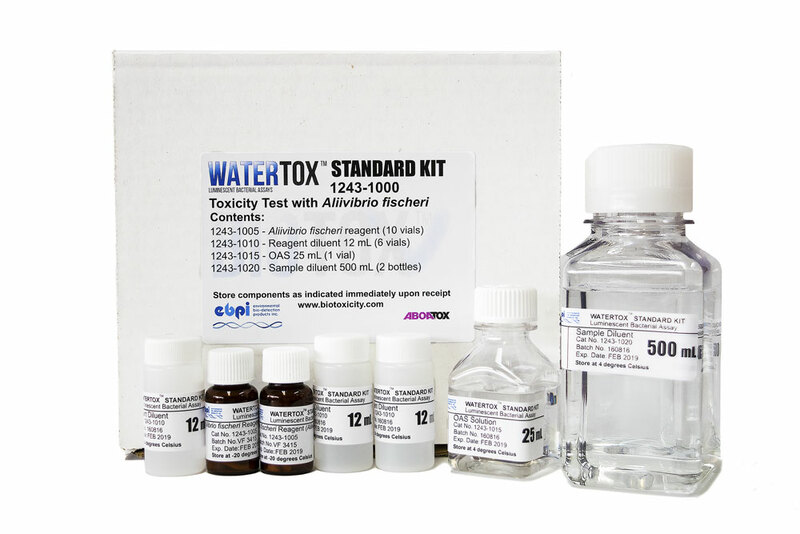 The WaterTox STD (Standard) 1243-100 kit is packaged to provide users with a complete setup to replace traditional Vibrio Fischeri acute toxicity tests (Microtox users). All required reagents and solutions are included with the kit to permit facile adoption using current commercial detectors like the M500. The WaterTox EVO (Evolution) Vibrio Fischeri kit is packaged as a cost effective alternative to the 1232-1000 Water Toxicity Kit. Bacterial reagents are packaged to permit less reagent waste for smaller sample numbers. The Vibrio Fischeri operation protocol has been simplified to reduce pipetting steps and a NaN3 tablet is included instead of a OAS solution. Results can be interpreted by any approved ISO luminometer. Product No. 1243-700 The LumoPlate Vibrio Fischeri test allows complete solutions for clients requiring a more accurate and robust assay system. The LumoPlate Vibrio Fischeri assay accounts for sample coloration and turbidity and can be used for direct measurement of soil and sediment samples without time consuming correction procedures. The Vibrio Fischeri bacteria and reagents are packaged to accommodate 96 endpoints per run (10 test per kit). LumoStix Vibrio Fischeri test includes reagents, diluent and the "LumoStix". This Vibrio Fischeri contact test allows for 20 individual measurements (Vibrio Fischeri bacteria are packaged to allow for 4 determination per vial - the LumoStix is designed to be used with the Kikkoman PD30 luminometer). 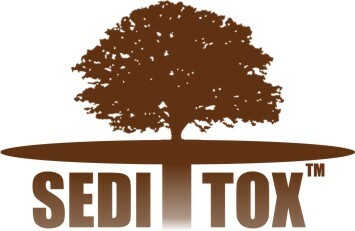 EBPI has developed and launched the contact sediment test for both detection of toxicity and genotoxicity. The SediTox platform is based on the novel bacterial strains also used in the EBPI line of Toxi-ChromoTest, SOS-ChromoTest and the UMUChormoTest products as well as Vibrio fischeri bioluminescent bacteria. The SediTox Kit employs a direct sediment exposure method to assess total responses from all soluble, insoluble, organic, inorganic, and volatile molecules in a given sample. Rapid bacterial-based colorimetric (or bioluminescent) bioassay for acute toxicity or genotoxicity . The assay will detect additive, synergistic and antagonistic effects in toxicant mixtures. Sensitive to a wide spectrum of toxic (genotoxic) substances. The EBPI Express SOS and UMU Strains can be utilized to detect genotoxic potential of metabilites. Detection of direct toxicity (genotoxicity) without the need for labour intensive extraction procedures. EBPI is proud to officially announce the release of our NEW Ames bacterial strains, called the Ames-ExpressTM strains. 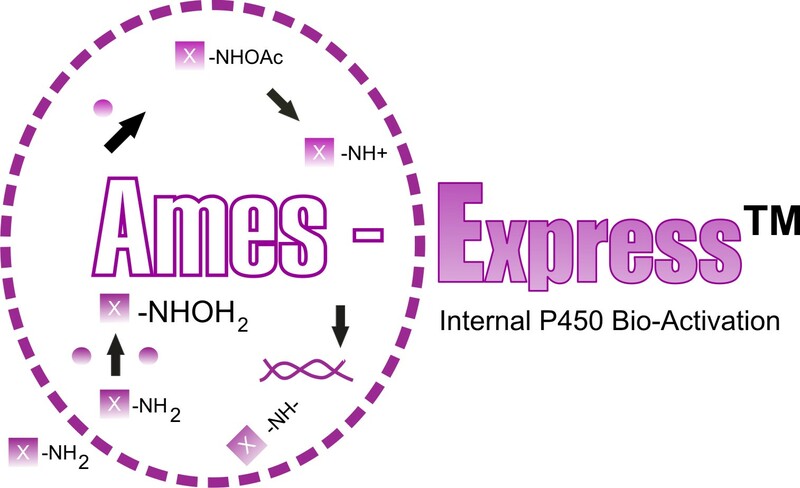 Ames-ExpressTM strains are constructed from normal Ames bacterial strains (TA100, TA98, TA1535, TA97a, TA1538), but have been engineered to also express either human P450 or GST-theta liver enzymes internally, which promotes bioactivation of xenobiotic molecules into DNA reactive species in the absence of an S9 mix. Short-lived, reactive metabolites are created within the bacterial cell in close proximity to target DNA. Eliminates the need to incorporate S9 liver extract. Improvements in sensitivity and selectivity compared to traditional Ames assays. Response suppression from interactions with S9 lysate mix is eliminated. The system expresses recombinant human proteins rather than rat liver extract, which improves extrapolation of mutagenicity data to human health endpoints. Please visit, EBPI Toxicity Test/Ames Express for further information or download our Ames Express Handout here. EBPI is a biotechnology-based company specializing in the manufacture and custom application of simple, rapid, and cost effective methods for detection and monitoring of toxic, mutagenic and genotoxic materials. The Environmental Monitoring Management Application (EMMA Pro) stores environmental data in a database which allows access of the data through a geographic interface. MicroBioTests Toxkits are higher level organism toxicity tests in a kit form which are used for the detection and quantification of the toxicity of chemicals and or solid and liquid wastes which pollute aquatic and terrestrial environments.